From now on I shall do a monthly recap here of my Library Mice Picturebook of the Week feature which appears on Twitter and Facebook. I have only just got back to blogging after a hiatus while I wrote my dissertation so there is no quite a review for every week of January, but normal service has now resumed. 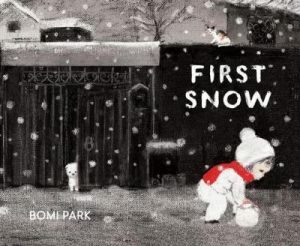 With a style and a focus on the tranquil moments of childhood reminiscent of Library Mice favourite Komako Sakai, Bomi Park’s début picturebook “First Snow” shines, offering a beautiful story of a little girl who goes goes out in the middle of the night to enjoy the first fallings of snow. Together, the use of textured paper, a limited colour palette and sparse text help create a mysterious and enchanting atmosphere in the is beautifully rendered tale. The circumspect text not only gives readers time to notice details in the artwork (particularly the animals) but also allows them to create their own version of the story. A graceful, serene and beguiling snapshot of childhood. 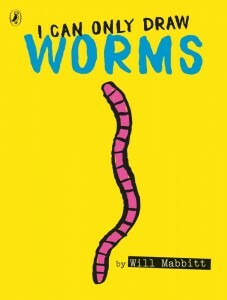 This tale of a group of worms, with its bold colours and lines as as its clever use of negative space and typography is a hoot, and visually striking. The picturebook maker doubles as the narrator and talks directly to the reader which makes the text particularly engaging, and its gently satirical outlook on counting books will not be lost on the targeted audience. Wonderfully giggle-inducing, this is nonetheless not JUST a funny book; covert observations about accepting others might be different and that this should not divide us can be found in the undertones of this bright and cheerful book, with a particularly potent penultimate spread. Patricia Hegarty has penned some of my favourite illustrated non-fiction books of the last couple of years and her latest offering, a collaboration with new talent Ryan Wheatcroft, is no exception. The rhyming text is catchy and flowing and is accompanied by vignettes which are reminiscent of old polaroids, an effect emphasised by the colour tones in the artwork. Hence, the book has the air of an old-style photo album of snapshots of family life, which readers are invited to flick through. 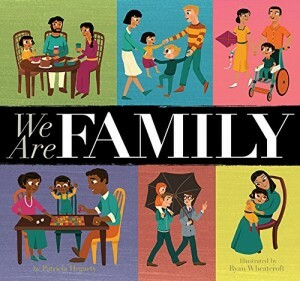 Families of all shapes and sizes are showcased and both text and artwork highlight that despite our differences, we are nonetheless all the same, and more importantly, that no family is perfect. This wonderful book will invite plenty of discussion at home and beyond.